How do I remove Labor Cost info from the schedule? Admins and managers see totals of hours and labor cost to assist them in scheduling. If you would like to print a copy of the schedule for your staff, we understand that you don't want this info to show. Here's how to remove it from the printout. 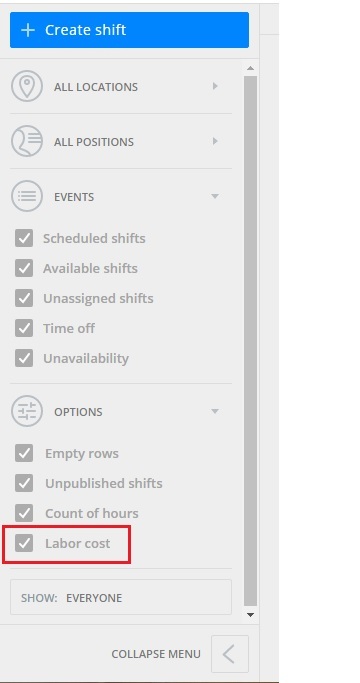 From the Shifts page, you'll see filter options on the left side. Under the Options section, you'll see Labor Cost listed. Click to deselect it, and the wage information will be removed. This applies to any of the filter options you see in this panel, so you can customize the way your printout looks.